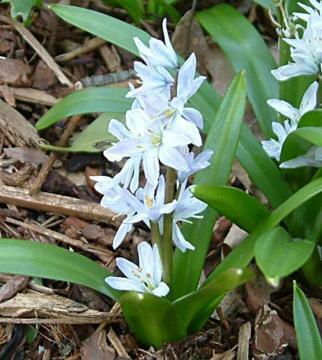 Dwarf early spring bulb producing clusters of star-shaped flowers, pale silvery blue with darker stripes. Starts to flower almost as soon as soon as it emerges above ground, with the stems gradually elongating. February or March. Plant bulbs in late summer or early autumn, about 8 to 10cm deep. Reasonably fertile, preferably humus-rich, well-drained soil in full sun or part shade. Very hardy. By division of bulb offsets or from seed. Mass planting in woodland gardens, borders and underplanting beneath and around deciduous shrubs. Native to Georgia, Armenia, Azerbaijan and Iran.